Edinburgh is a city rich with stories. Its ruins speak of lost glory days, its castles of the might of great kings, its solid city buildings of prosperous commerce, its narrow winding streets and rows of terraced houses whisper with the histories of ordinary folk and its monuments tell of heroes great and small. 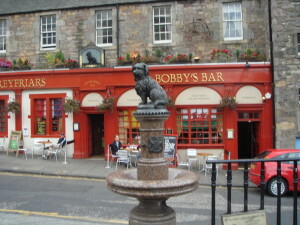 While Greyfriar’s Bobby is probably Edinburgh’s smallest hero, he is also one of its most famous. Bobby and his story are known across the globe and have inspired countless other dog stories, books and films, including such classics as Old Yeller and Lassie. Bobby is often the yardstick against which many of the worlds’s smartest and most devoted dogs are measured and “S/he’s another Greyfriars Bobby”, “s/he’d leave Greyfriars Bobby for dead” and “s/he’d give Greyfriars Bobby a run for his money” are often heard phrases in canine appraisal. 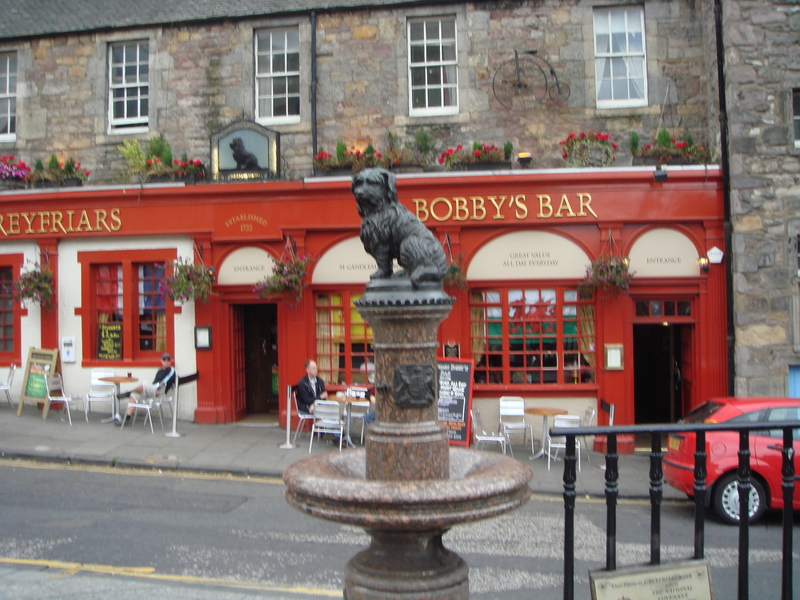 I must confess that until I spotted his statue outside the Greyfriars Bobby Bar, I hadn’t known that Bobby was an Edinburgh dog. Furthermore, when I thought about it, I really only vaguely knew his story. It’s a poignant, moral tale and one worth the telling. 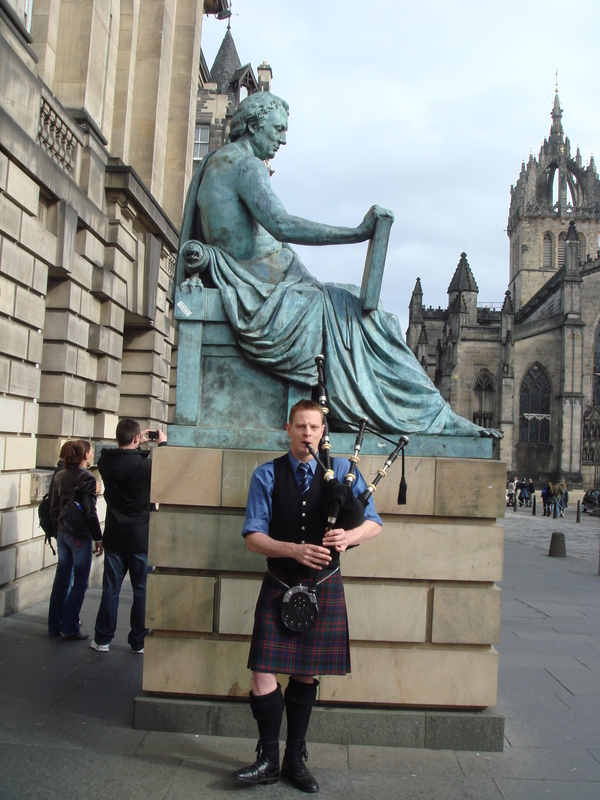 John Gray came to Edinburgh from the country, with his wife Jess and his son John sometime in 1850. Unable to find a job in his usual work as a gardener, he became a night watchman for the Edinburgh Police and was assigned to the area around Greyfriars churchyard. As nights on the beat were long and lonely, John took as a companion a little Skye terrier which he named Bobby. Over the years, Bobby and John became known to everyone in the streets around Greyfrairs and in the local Coffee House where they were daily customers. Sadly, in 1858, John died of TB. He was buried in the churchyard which he had patrolled for the past eight years. Just as he had been John Gray’s constant companion in life, so Bobby continued after his death. Day and night, he lay at his master’s grave-side, moving only at the sound of the 1pm gun, when he would run to the Coffee House for a meal. For weeks the keeper of the graveyard tried in vain to take Bobby home with him. Finally, he realised that the dog would never leave his master, so he built a makeshift shelter beside the grave and this became Bobby’s home. 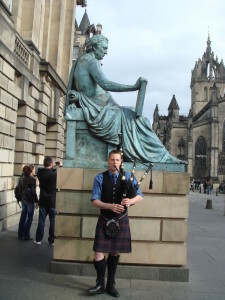 Bobby’s story spread throughout Edinburgh and every day at one o’clock a crowd would arrive at the gates of Greyfrairs Churchyard to watch him dash off to the coffee house for his meal. In 1867 the Edinburgh Council introduced a by-law that required all unlicensed dogs to be put down. Bobby, it seemed, was doomed. But the Edinburgh public immediately rallied to save him. Sir William Chambers, then Lord Provost paid his license and presented Bobby with a collar fitted with a brass disc on which were inscribed the words “Greyfriars Bobby from the Lord Provost, licensed in Edinburgh”. Bobby kept up his vigil at his master’s grave for fourteen years. He finally passed away on the 4th of January, 1872. Bobby was denied a final resting place next to his master in the consecrated ground of Greyfriars but was buried instead outside its gates within sight of the grave. The story of Greyfriars Bobby is not just a story of a loyal and devoted dog; it’s also a story of the generosity of spirit of the people of Edinburgh at the time and the value they placed on loyalty and devotion. The trouble with lightning weekend visits is that there really isn’t much time for anything. This is a shame when the place is one you’ve never visited before and will probably not have the opportunity to visit again. It is a double shame when the place is peopled by kindred spirits and is as historically interesting and as dramatically beautiful as Edinburgh. Edinburgh city is small, featured by imposing stone buildings, glimpses of distant steep green hills with jutting rocks, expansive green parks with spreading trees, ancient ruins, spectacular monuments and castles. We took the touristic walk up the Royal Mile from Holyrood Palace at one end, to Edinburgh Castle at the other, missing one extraordinary Edinburgh opportunity after another as we went. There wasn’t time to see the weaving exhibition at the Tartan Mill and a run round two of its four floors threw up a dozen or more fabulous knitted and woven wonders that we couldn’t possibly carry in our limited luggage. Over at the road at the Whiskey House, we just missed the tasting tour. We didn’t have time for the tour of Edinburgh Castle and missed the famous Tatoo by a month. We did our best to re-cap at least one lost experience and ducked into a bar half-way down the hill to sample some real Scottish Whiskey. Highland Park was the recommendation of the Texan Barmaid and a very good recommendation it was too. With a wee bit of fire in our bellies we wound off down the hill, passing a statue of Greyfrairs Bobby and a bar of the same name, through the Grassmarket and Fountainhead and finally to hallowed Rugby Ground at Murrayfield.